Tumbled Dalmation Jasper healing gemstones. Nicely tumbled and polished with lots of spots and color variations. Dalmation Jasper assists with telepathic animal communication, and is a stone that lessens or removes disillusionment. Size: 1 inch with some slightly larger. Good stimulator for visualizing this life and past life scenes. Promotes our awareness of the beauty of Earth. Helps with meditation by providing nice grounding energies. Aids in stabilizing creativity by bringing new ideas and opening artist blocks, is an aid for drawing and painting. Dalmatian Jasper has a Trigonal crystal system and is the mineral class of oxide in the Quartz group. Basically, most Jaspers are a fine grained Quartz that holds lots of foreign materials. Dalmatian Jasper forms in a sedimentary manner when the original silicic acid solution seeps into sandy rock and becomes saturated with lots of suspended particles. The orange color spots come from iron, the darker black to brown spots can be anything from old plant material to old sea bottom materials (shells, etc.). The pale yellow background comes from finely ground clay and sand particles. Dalmatian Jasper can be found world-wide. I found Dalmatian Jasper to have very settling qualities when held during meditation. I came away feeling more goal-oriented and paths to complete projects seemed clearer. When used at the first Chakra for grounding, I did find it's energies very soft and eventually used it with a piece of Quartz which seemed to amp up the grounding effects provided. 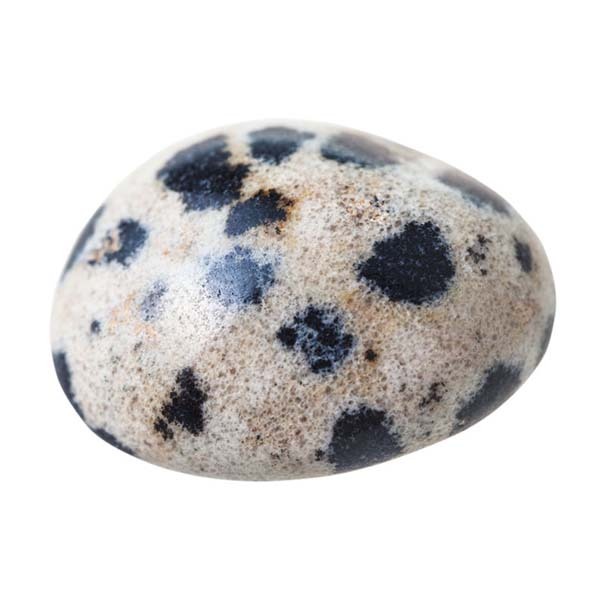 Dalmatian Jasper assists with telepathic animal communication, and is a stone that lessens or removes disillusionment. It helps one to see their strengths and weaknesses, and encourages grounding both with the Earth and in reality. Dalmatian Jasper increases loyalty and is beneficial for long term relationships. It helps us deal with things in a forthright manner and provides the endurance needed to work through a problem to the end. Dalmatian Jasper is a stimulator for honesty, to ourselves and to others. It can provide the courage to 'come to grips' with even unpleasant tasks. It aids our imagination and helps to transform ideas into actions. Dalmatian Jasper can help to purify the blood, it is also a stone of protection from nightmares, depression and negative thinking. It is particularly beneficial for healing people who have trouble relaxing and having a bit of fun. Dalmatian Jasper has a special affinity with Virgo but benefits all signs. It has a Projective Energy, it's Element is Earth and its Planet is Earth. 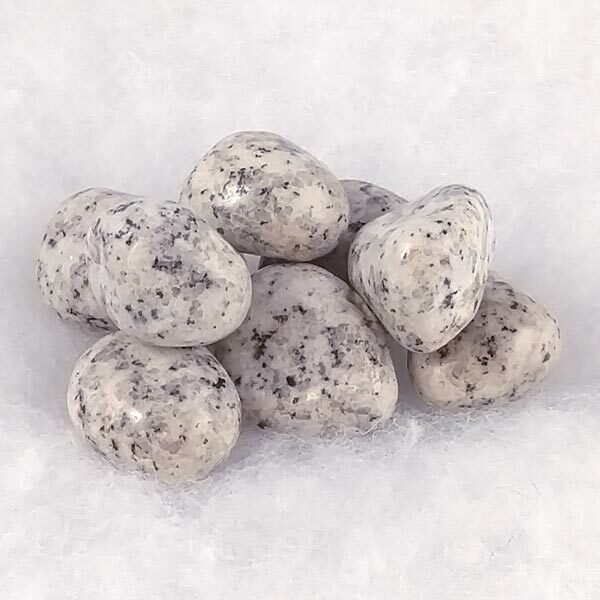 Dalmatian Jasper has been used as a protection amulet for those who suffer from nightmares, negative thinking, depression and also helpful in keeping one relaxed and in good spirits. It has been carved into scarabs in ancient Egypt, and some variations were considered to be a stone of warriors during the middle ages.